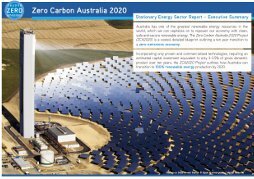 The Zero Carbon Australia Stationary Energy Plan has been produced by Beyond Zero Emissions, a non-profit, independent climate change solutions research and advocacy group as part of the Zero Carbon Australia 2020 Project (ZCA2020). It provides a ten year roadmap for a transition to 100% renewable energy in Australia with baseload energy supplied by renewable sources. The stationary energy sector includes all infrastructure that generates and distributes energy to end users and includes electricity generation plants, natural gas and oil recovery, refining and distribution. In ZCA2020, fossil fuel-fired electricity generation is replaced by renewable energy, principally concentrated solar thermal with storage and wind generation. Natural gas and fossil-based liquid fueled transport is likewise phased out and replaced by transport powered primarily by renewable-generated electricity, with a small use of biofuels in rural areas and emergency services. Elimination of these fuels causes an increase in the total national electricity demand from 211 Terawatt hours (TWh) (2007) to 325 TWh (2020) excluding off-grid generators. However, by employing greater efficiency in the use of energy generally, and by minimising the use of inefficient internal combustion engines, the total amount of energy delivered in Australia falls from 3,834 Petajoules (1,065 TWh-equivalent) in 2007 to 1,643 Petajoules (456 TWh-eq) in 2020. In the building sector for example, energy-saving measures employed in the ZCA2020 plan include a switch to heat pump heating and extensive insulation of all commercial and residential buildings. Overall, 60% of electricity supplied by a 100% renewable stationary energy sector will be provided by concentrating solar thermal with molten salt heat storage and 40% by wind power. Photovoltaic solar panels will also produce electricity during sunny periods, and hydroelectricity and crop residual biomass will provide back-up energy when needed. The cost of the transition to renewable energy is affordable at $8 per household per week. The ZCA2020 plan requires a total investment of $AU370 billion over the period 2011-2020. Annual investment would average $AU37 billion per year. I believe our long-term global goal is to very substantially reduce our emissions, a goal that will require almost all of our energy to be produced from zero or very near-zero emission sources... The work they [Beyond Zero Emissions and Melbourne Energy Institute] have done is important, it provides the most comprehensive technical blueprint yet for what our engineers, our scientists, can begin to do tomorrow. This page was last modified 07:38, 21 September 2015.